As summer has started, many Dojos are enjoying a well-earned holiday. So what to do when you are on that Spanish beach enjoying a Piña colada? Or maybe you are not a football fan and you are looking for something to do during that world cup final. 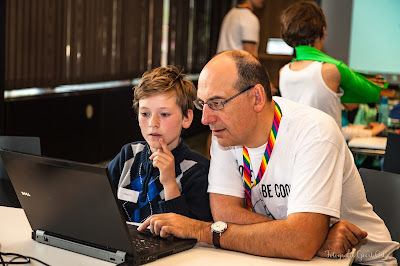 Well, here is the solution to all of your problems: the second CoderDojo Belgium newsletter. Oow yes, even when temperatures are rising, CoderDojo Belgium is your loyal provider of everything fun and coded. Do you want to contribute to the newsletter? Would you like to write an article for the tech corner? Maybe you would fancy being interviewed for the meet the coach/cook column? Other ideas? Contact us via info@coderdojobelgium.be. We are still looking for some extra coaches. Help us by sharing the reason why you coach with the hashtag #IcodeCoderDojo. Many thanks and enjoy the newsletter! Next newsletter coming up by the end of the summer.